Mark your calendars for the 2018 Hakalau Jodo Mission Obon Festival! 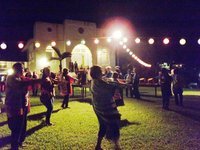 The summer Obon season perpetuates the Buddhist tradition of honoring the spirits of those passed on with special services and festivals. The festival includes food booths, taiko drummers and other colorful sights and sounds, and of course, bon dances that have become a cultural touchstone for all in Hawaii. Free to enjoy! The history of the Hakalau Jodo Mission is a story of community engagement, a mix of people, cultures and values. This history also reflects the Japanese American experience in Hawaii, beginning with Japanese immigrants and their families in the Hakalau area in the early 1900's. Over time, the community expanded and became more diverse, reflecting the mix of individuals on the plantation regardless of religious beliefs or philosophies. daniyang8 . 更新日 7月 17 2018 10:56 a.m.